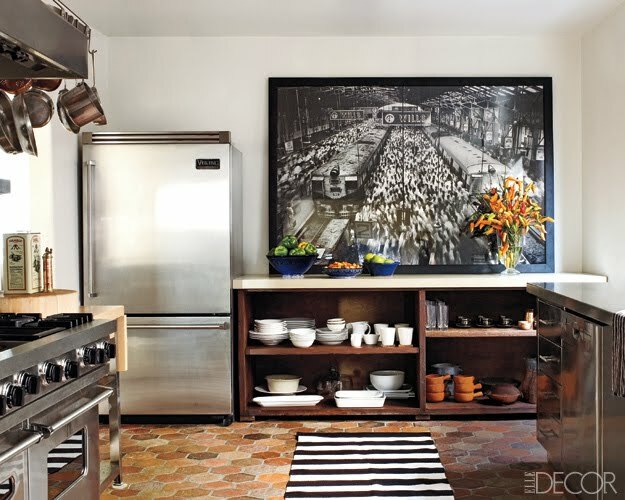 OOH FANCY THAT: .. ellen pompeo's home ..
.. ellen pompeo's home ..
Esther first showed me the feature on Ellen Pompeo's 1920s style Spanish home in Elle Decor, and I just had to share it with all of you. Interior designer Martin Lawrence-Bullard worked on the home with the actress. I love how they were able to brighten up the place with a Mediterranean flair, while still maintaining the integrity of the dark woods, molding, and ceiling beams of the home. The kitchen is my favorite! I adore the stainless steel appliances and modern artwork juxtaposed against the dark woods and floor tiles. Oh, the high ceilings are to die for.